The stress of hectic, high-pressure jobs can have a disastrous effect on the health of your executives and your business. Your executives need the best health care available and the starting point is a comprehensive executive health assessment (commonly referred to as executive medicals or executive physicals). Each of your executives is unique, with unique health issues, concerns and goals. The Total Health Assessment™ is uniquely tailored to each of your executives. Your physician, registered dietitian and fitness consultant, along with other team members when necessary, analyze the results of your assessment and create a practical plan you can work and live with to improve your health. An executive health assessment is a great starting point to achieving better health, providing baseline health information that can be used to make the improvements necessary for optimum health. But it’s the follow-up programs and treatments that lead to those improvements. Annual assessments do not provide an ongoing way to monitor health issues. If a health issue arises between annual assessments, it will go undetected. There is simply no substitute for regular medical care. After the assessment, patients must still schedule appointments with their physicians, specialists and other health care practitioners. With busy schedules, it can be challenging to take the necessary steps. We believe a total assessment needs to be done only once, if proper follow-up services are provided. Your executives want to know that their health, and the health of their families, is in trustworthy, capable hands – a physician who knows them and understands their unique issues. 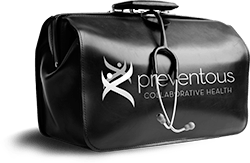 Preventous’ customized approach eliminates unnecessary tests and cookie-cutter fitness or nutrition advice. We give your people the health care they deserve and desire so they can achieve peak health and contribute to your organization’s success for many years to come. At Preventous, this is achieved through our Twenty-Four Seven Club™ program and a variety of other services that contribute to your total health.